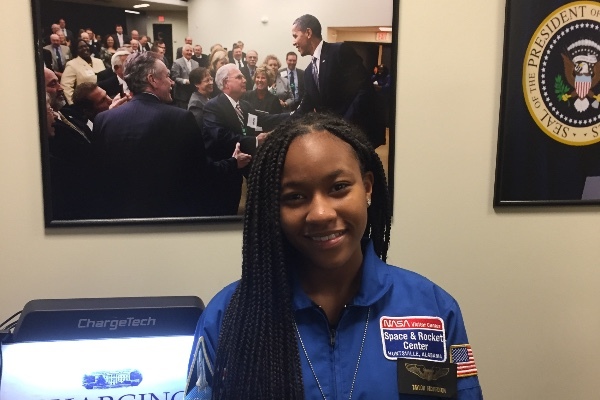 Richardson, who lives in Duval County, Florida, is an aspiring astronaut who wishes to empower girls to dream as big as she does. According to Fusion, after she attended the White House Hidden Figures event, Richardson decided to raise money for other girls in her community to see the inspiring film. Okay, Taylor Richardson, who goes as Astronaut StarBright online, is officially the coolest 13-year-old in the world. After seeing this incredible movie, hearing from the cast, words of wisdom from The First Lady, Michelle Obama, and meeting Katherine Johnson's daughter and grandson, I left D.C. feeling incredibly inspired to pay it forward for some girls in my community to have a special viewing as well. But not just girls of color all girls from all walks of life in my city who may have the courage to dream BIG and not let what they can't see or as my idol Dr. Jemison says, "be limited by others limited imagination," see this movie. So far the campaign has raised $8,556— well over her $2,600 goal— and we couldn’t be happier for her. Richardson took to Twitter to share her excitement at the opportunity to invite more than 100 girls to the movie viewing. Over 100 young girls will soon see a movie about the black female mathematicians who were integral in achieving the first orbit around earth. That is something to feel really good about. We can’t wait to see what other astronomical goals Taylor Richardson reaches in her life.